THE PERFECT INSTANT POT ACCESSORY Made from High Quality, FDA Approved Food-Grade Silicone. PERFECT SIZE: Fits perfectly in a 5, 6 or 8 Qt Instant Pot. A Must-Have Accessory for your Pressure Cooker. THE PERFECT PRESSURE COOKER ACCESSORY! Made from High Quality, FDA Approved Food-Grade Silicone. Use in your Pressure Cooker such as the Kuhn Rikon, Power XL, Cuisinart, Fagor, Costaway, Faberware, T-fal, Elite, GoWise, Secura, Gourmia and others to make delicious Starbucks-Style Sous Vide Egg Bites or Ooey-Gooey Brownies!Make 14 Egg Bites in one go! Recipes Included insideStore Home-Made Baby FoodAir tight seal keeps food freshBacterial, Odor and Stain ResistantFreezer-Safe Tray and LidUse in the microwave or oven (up to 425 F) for baking (Tray Only) Egg Bites Mold is Dishwasher safeFits perfectly in 5, 6 or 8 Qt Electric Pressure CookersVERSATILE AND HANDY: Use the 8 ¼" diameter trays for all kinds of foods: 1) Egg Bites2) Baby Food3) Large Size Ice Cubes for Juice Pitchers4) Snack foods5) Brownie mold6) Easy portion control7) Pet food storageThe functions of the Sensible Needs Silicone Molds are endless! - PERFECT SIZE: Fits perfectly and designed to fit in a 5, 6 or 8 Qt Electric Pressure Cookers. A Must-Have Accessory for your Pressure Cooker! 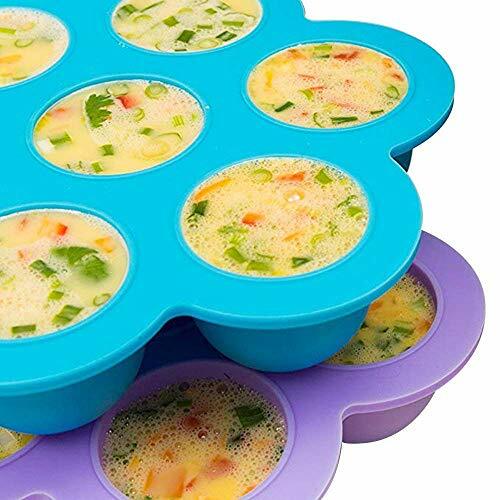 - MULTIPURPOSE: 8 ¼ diameter Food-Grade Silicone molds - Use for Starbucks-style Sous Vide Egg Bites, Poacher Ring, Brownies, Popsicles, Baby Food, Yogurt, etc. - STACKABLE SET: Make 14 Egg Bites in One-Go - Save Time by Making Double the Goodness!